Written by Jennifer Y.J. Hsu. 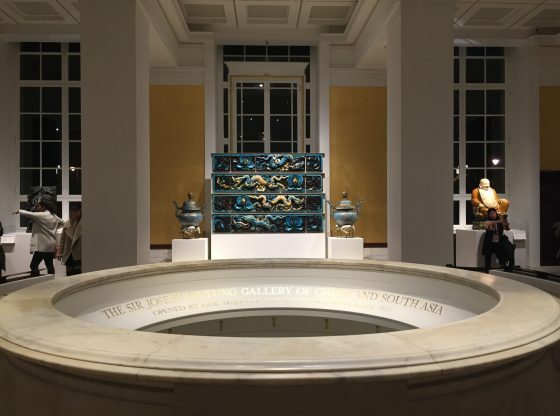 The refurbishment and reopening of the Joseph Hutong Gallery at the British Museum in November 2017, which houses the South Asia and China collections was long awaited. As China scholars and observers, we are engaged with our students, media and the general public in providing a more nuanced understanding of modern and contemporary China. However, the footfall into our public cultural institutions has an enormous potential impact to shape public perception of China. On any given day in the China gallery, the place is busy, buzzing and energetic – full of Chinese and non-Chinese tourists and local gallery goers. Thus, the selection of art objects to convey a particular narrative or narratives is especially important to consider: a) because of the relative permanence of the displays (although fragile objects are rotated) and; b) the reach of the British Museum is significant with 5.9 million visitors in 2017. 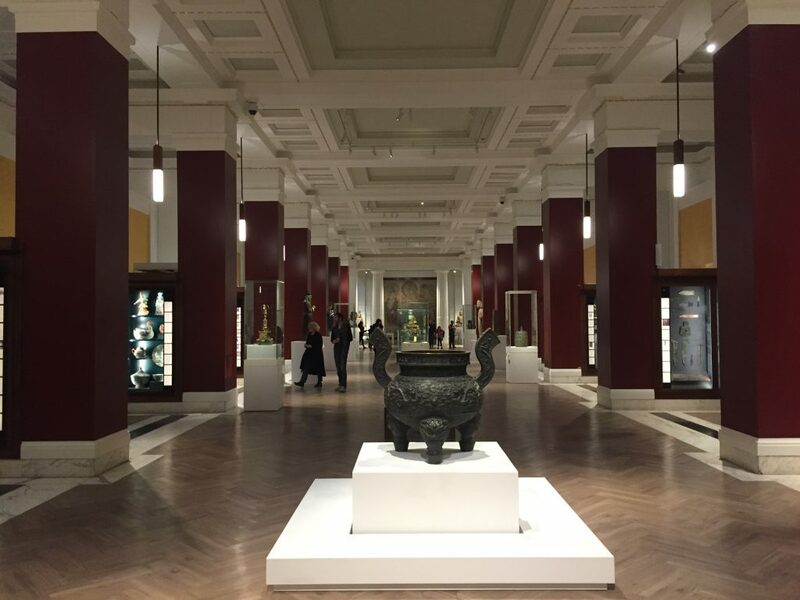 Here, I take the opportunity to focus on the British Museum’s recent re-opening of the China gallery and to assess the narratives presented about post-1911 China. What is regarded as “modern” and “contemporary” China, and how it is conveyed require attention and dialogue, particularly in an age when misinformation is routinely thrown about as facts. Consequently, our public cultural institutions are more important than ever given their educational purpose and remit. The Modern China display seeks to place Chinese artistic changes and cultural developments of the last 5000 years within the context of the other objects on display. With so much pottery, bronze, ceramics, porcelain, lacquer, paintings and calligraphy on display covering the last five millennia, the objects selected for the Modern China display draws out a dialogue between new artistic forms of expression vis-à-vis China’s expansive artistic and cultural history. The stories conveyed in this small display are ones of modernity but also an unshakeable continuity with its past. Yet, a few key objects indicate the challenges that have beset China during Mao Zedong’s rule and since the reforms of 1978. We can decipher two main narratives offered by the Modern China display. The first is how contemporary Chinese artists respond to the social, cultural, political and economic changes of the last 40 years. The second narrative is how contemporary artists engage with traditional forms of artistic creation. These are two very different narratives but the curators have subtly brought these two strands together through a few select objects. As we leave the Modern China display, we may be able to draw the following intersections and conclusions: contemporary artists are feeling the anxieties of reform, as indicated in the paper-based works and paintings but perhaps the panacea to that anxiety is the utilisation of traditional methods of art making. The curatorial efforts in the interpretive texts could be improved to draw out the contemporary usage of traditional art methods and the challenges it brings in an era where so much is in flux. Some object labels in this display speak to the process of this art making but not all do. The intersections of these two narratives can be drawn but this is where the curatorial expertise is required in the formulation of texts and labels. Below are a few examples from the Modern China section at the British Museum to highlight the different narratives. The first narrative is how Chinese artists have responded to the rapid domestic changes that have taken place in the last 40 years. Zhang Peiyi’s painting After Rain is a response to the transformations that have taken place in Beijing over the last four decades. Using traditional woodblock printing, the imperial architecture of the Forbidden City is contrasted against the skyscrapers and cranes in the background. The dark clouds, perhaps indicating the uncertain future, are foregrounded by the rainbow and doves. It is both a painting of hope and uncertainty. Thus, by displaying After Rain, we can perhaps suggest the artist is using traditional art-making methods to express contemporary anxieties. The second narrative concentrates on the aspect of the art practice and techniques adopted by contemporary Chinese artists. The practice of making lacquer and jade carving speaks to the variety of objects in these media in the other display cabinets of the different time periods. In the Modern China section, the focus is on the method, reform induced anxiety is not highlighted. In the example of lacquer box with a gate knob, the emphasis is on the exquisite object and rightly so. Lacquer making is still alive and well-respected in China today. However, where the attention is on the object rather than the current conditions in China, there is little to no explanation as to the social, economic, cultural or political context to locate that object or the artist. Thus, in such case as the lacquer box, the two narratives discerned from the Modern China section do not neatly coincide and thus render the display not entirely coherent. The third narrative, less connected with the above two is one about identity, more specifically “who is Chinese” and “who can speak and represent contemporary Chinese artistic expression today?” It is interesting that within this small display, two art objects are by Chinese-British artists. The Mandarin Butterfly Series is a ceramic sculpture by Caroline Cheng, born in Cambridge, UK, who studied in the US before moving to Hong Kong and who then opened a pottery studio in Shanghai. An abstract painting by Yeung Hai Shuet was produced in the UK, where he has lived since 1969. By incorporating these artists’ works, the display speaks to the notion of “Chinese” that are located beyond national boundaries. 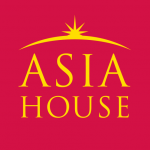 The Chinese diaspora is large, spanning from Southeast Asia and now to Africa. These works push us to think about categories and representation: how does the Chinese diaspora respond, dialogue, engage with what is occurring in China today, whether it is the politics or the social challenges? How is this reflected in their artwork, if at all? Should such works be located in the Modern China display? What was the curatorial choice in locating these displays in Modern China? One of the compromises in displaying the majority of the objects in these large cases is the limit placed on audience engagement with the objects. The glass cases present a challenge when wanting to see all angles of an object. Such cases present a static nature to both the display and objects. We are able to observe the craftsmanship of the objects, and this is an aspect that is emphasised in the interpretive text, for example, with the lacquer making. However, we are not invited to consider the utility or function of the objects which had more than just a decorative purpose. By placing the objects behind these glass cases, the objects are rendered as an object of art, and are treated as a connoisseur would, with careful observation of its details and the workmanship. Yet, what are we to make of having Warhol’s Mao painting behind this case? Does such curatorial decision render the mass consumption nature of Warhol’s painting (he produced more than 190 paintings and prints of Mao) into a reified piece, elevating the painting to the same status as the delicate porcelains of the Ming and Qing era? The mode of display as seen in the Modern China bay leads to interesting questions about curatorial choices and philosophical questions about the value—not just economic value but the intrinsic value—of these objects. One cannot leave the Modern China display without encountering Warhol’s Mao and perhaps wonder its relevance in this section. Warhol’s Mao is indeed iconic and perhaps the image the West has of China, that is if asked what represents China, this maybe an image that many non-Chinese have: Warhol’s Mao. Representations and identities are fluid but they can also be challenged. In 2013, when Pittsburgh’s Warhol Museum undertook a survey show in China, Warhol’s image of Mao was not permitted into the show by the Chinese authorities. As essential as Mao is to modern China and to the Chinese Communist Party, so too is Mao for Warhol’s body of work. Artistic representation of Mao whether by Chinese or non-Chinese artists, living or dead, cannot side step past and present politics of the country. The Modern China display in the British Museum is still in the process of completion but my aim here is to consider the narratives presented about China and Chinese identity through art objects. The role of the curator and the museum is important in presenting a balanced understanding of a foreign country. The role of the curator, as seen through the written interpretive text and modes of display chosen for these objects have an enormous impact as to how the audience understands China from 1911 onwards. What we are offered is a glimpse of the transformation that have taken place throughout the 20thand 21stcentury via different art media and artistic methods, and from different artists who “speak” to the Chinese identity, Chinese or not. 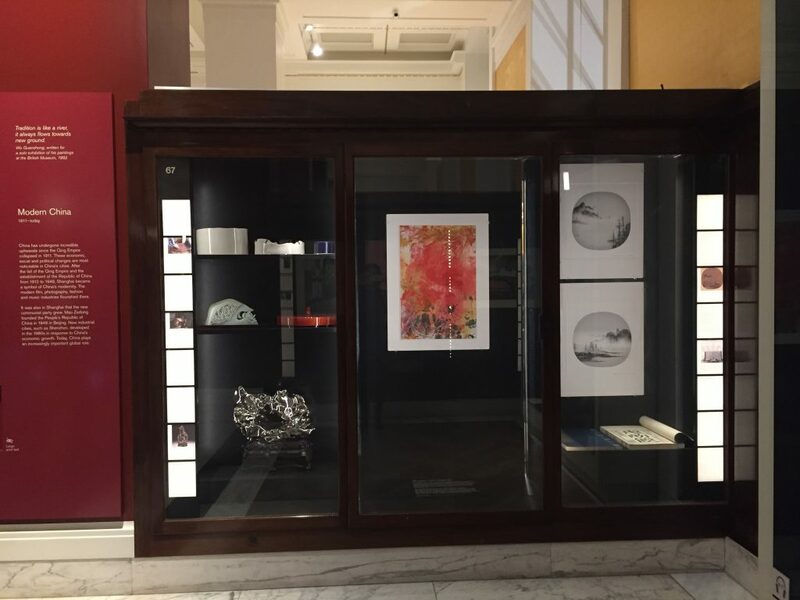 The strength of the display is that the heterogeneity of China is conveyed, thus there is no singular representation of China, and this is clearly the case when thinking about artists’ identities and their objects on display. While there are gaps in the interpretive texts and narratives, we must support and connect with our public cultural institutions to engage in relevant curatorial decisions to counter the increasingly parochial visions of the world as peddled by our leaders and politicians. Jennifer Hsu is a Visiting Fellow in the Department of Social for the 2017-2018 academic year. She is an associate professor in the Department of Political Science at the University of Alberta, and a Non-Resident Senior Fellow of the China Policy Institute at the University of Nottingham. Note: Images taken by the author.